By some magic of the “inter-webs”, you have landed on my blog-Welcome! I am Shilpa Tripathi and this is the internet portal to my thoughts, my work and my digital footprint. I’m thinking that I should introduce myself, so here it goes! My parents are pretty prophetic because they chose to name me Shilpa, which means “artist”-my life has come to symbolize a pursuit of beauty, aesthetics and expression. Although I am American, I was born in a small city in North India and my family migrated to California during my early childhood. My youth was like a pendulum, migrating to different parts of California and India every few years. I loved it. Being in a new place always gave me the chance to reinvent myself. To be someone different. To inculcate different mannerisms. Perhaps it was this tendency that developed my love for acting. Then I moved to the city of Angels! In my recent past, I’ve spent time traveling, modeling (as a titleholder for the Miss Universe India Pageant 2010-11) and being a spokesperson for TERI (The Tata Energy and Resource Institute 2010-11). It was a life-changing experience to have my voice heard and my opinions matter, and I got pretty addicted to it. Being in front of the camera, modeling and raising money for charities was amazing but what I loved was that feeling of contribution, which I had from hitting the pavement daily and interacting with people from all walks of life. I learned, that year, that I must always work hard, keep growing and be gracious-accomplishments are not stand-alone events, but must propel me to greater heights and a higher conscience, every day. I continued to chase the limelight with a degree in Acting for Film and worked with talented, upcoming directors in indie films. Perhaps the best advice regarding my pursuit of stardom came from David Morrissey of the Walking Dead fame, who, in a fated exchange, urged me to look at the emerging meaning of international fame. He asked me why I would choose to be a tool for someone else’s creativity when I had such a rich creative mind that could change the world. He urged me to tell my stories and express my art in every avenue possible. He urged me to be a creator. He changed my life. In his “Creative Live” presentations, Chase Jarvis asserts that the future is for multi-hyphenates. I agree! Today, we have the platform and tools to create scalable products and services that can change the world. Better yet, we have the power to pick up infinite skills without apology. We truly live in great times, a prime time to be a multi-hyphenate. However unintentionally, my creative pursuits and passions definitely qualify me as one. I completed my bachelors in Media Arts and Animation with honors, specializing in 3d texturing and lighting. Over the past decade, I have grown my abilities in drawing, painting, graphic designing, communication design, motion graphics, picture and video editing, storyboarding, animating (2d or 3d), modeling 3d environments and website creation. I am a Photoshop expert and an After Effects aficionado. I am a branding maven and a social media fanatic (I would love to have a chance to pick Seth Godin, Tim Ferris & Ryan Holiday’s brains!). I absolutely enjoy creating and consuming digital communication artwork-something I call art with implications. I’ve been living on the beaches of California for a while now and recently moved to Newport Beach. And boy is it beautiful around here! I’m doing my masters in Human-Computer Interaction at University of California, Irvine and have been working with Accenture Labs to create the next smart home tech that will make the lives of CNA’s that much easier! I also have a design blog at medium.com/@DesignNotes & write for the UX Collective. I fill my days with a lot of design, research, remote meetings, art, blogs and reading. I also practice hot yoga, kill it (or myself) at Orange Theory and love long beach walks in the morning. It sounds like I’m super healthy. Let me quickly cross that conclusion out. I am a healthy person in-the-works. Most of the days I struggle to deal with hypothyroidism, female, type A and a perfectionist who likes to procrastinate. I also love fashion and beauty. Make that: I love beauty. To me, beauty is a culmination of emotion, composition and character. Chasing beauty is now second nature to me. Did I cover it all? Hmm… Oh yeah…I love alternate everything (medicine, lifestyle, food, whatever…) and quench my curiosity for the “other” by making health potions, teas, masks and exfoliants. Did I mention cosmetics? I actually use a self-made body sunscreen as store-bought ones almost aways let me down! In essence, I’m a lifelong student with a desire to push my creative boundaries. 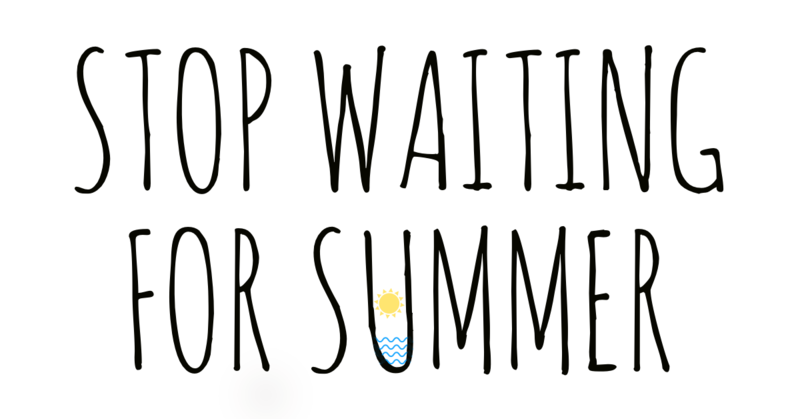 So, why STOP WAITING FOR SUMMER? Finally, STOP WAITING FOR SUMMER is a blog about the millennial curiosity and our struggles to match our dream life with our reality. I want to travel around the world, makeover, make-under, curate a lifestyle and present the fun stuff (secrets) and hacks I learn along the way. Of course I talk about girly things like fashion, beauty, lifestyle (#beachLife especially) and what I’m loving as a consumer. But I also talk about travel and how you might want to structure yours if you decide to follow my footsteps! Most importantly, I talk about real world stuff like fighting anxiety, depression, hypothyroidism, type A personality struggles and worst of all, procrastination. I really want to craft this blog to be as multi-dimensional as my life is.